A frigid soul in a cold barren land. She wanders around aimlessly, unknowingly guided by the Cosmo. Always alone but determined, she gazes towards the coal-black unflinching sky, her treasured flute by her side. At a distance spanning mountains wide, there is fire and warmth. A caravan can be seen, perched upon the snow capped mountains, the smell of barley and ale, the jovial atmosphere and the loud chattering of kith resting after a long day's travel. Unmistakably, the group of kith starts hearing a faint but sonorous melody. Not a second too long, a thunderous parade of jagged streaks can be seen painting blue the once austere sky. They jolt gently like falling Sakura leaves, chaotic but peaceful. The once loud chattering of the kith folk stops abruptly as if time itself has stopped. Even the previously biting gale lays still, replaced by the thunderous echoes of a forgotten past yearning for a distant future. As abrupt as it came, the spectacle ceases to exist. The void replaced by stars, slowly forming in the sky. And just like that, this band of weary travelers have bared witness to a famous bard's tale only thought to have been a legend. It's the strongest race in the game. Having +4 armor to burn and freeze attacks is just insane. This is because quite a substantial amount of enemies do burn/freeze damage and it's especially useful against the last boss considering that its ranged attacks are mostly burn/freeze damage. Now, that the secret is out. Let's all keep quiet so Obsidian doesn't find out. Why Devoted? This build has a 46% chance to crit so having that +25% crit damage would prove useful. That's not even the best part. Why we pick Devoted is because of the +2 penetration we get. Since we will be playing on POTD and since we will be using a Blunderbuss (low base pen), we will need as much armor pen as we can get. Why Nalpazca? It's miles ahead in comparison to any other monk subclass. This is because Helwalker makes us too squishy, Shattered is a no go because we need max wounds to take advantage of Turning Wheel and No Subclass gives us no benefit. Nalpazca on the other hand offers us a substantial benefit (+10 pl to drugs) with an easily fixed penalty (we need to take drugs). Also, Drugs are ridiculously good! Why we only need few of might, constitution or resolve? Our weapon (Blunderbuss) has a low base damage so +% damage from might is not that attractive, the +% healing we get is ok but we have enough ways to keep ourselves healthy. We will have enough defense rating (deflection, fortitude, reflex, will) to offset our non-investment in constitution. Resolve gives us an ok amount of deflection. We also have sufficient tools to lower hostile effect duration through Ring of Solitary Wanderer (-35% hostile effect duration) and Clarity of Agony (-5 sec Duration of hostile effects, -50% Hostile effect duration for 20.0 sec). Why we need a lot of dexterity, perception and intellect? We need dex to attack fast so we can keep procing Avenging Storm which is the reason for this build. Perception is the king of stats, especially in POTD. We want to hit enemies. As a side benefit, both dexterity and perception increases our reflex defense. With sky-high reflex, plenty of the heavy hitting enemy ranged aoe damage will miss us leaving enemies to rely on their puny basic attacks to do damage on us. Enemy spells shouldn't be an issue either as we have enough will to resist it. The reason why we max intellect is for the increased duration in our abilities, scrolls, and drugs. This is more valuable than it sounds! Why? Mainly for the Lore. Also, Mystic gives us +1 to Arcana (the active skill we are going to max). Why? We will be using Kitchen Stove which is a Blunderbuss. Why? Arcana along with Alchemy are straight-up bonkers as of patch 1.1. +1 Arcana is equivalent to +1 to power level of scrolls. We will be taking advantage of all the scrolls we can find/craft to unleash hell towards our enemies. Avenging Storm is our bread and butter. Why? We will be using the The Giftbearer's Cloth (+5 all defenses except deflection, increases with the History skill). Kitchen Stove - We want to use a Blunderbuss for its multi-shot passive. Kitchen Stove just happens to be the best Blunderbuss. Note# We want the modal on as it does crazy AOE damage. Its negative effect is offset by Intuitive from Disciplined Strikes. Note# The optimal enchantments are Frantic Reload and Wild Barrage. Hot Razor Skewers is really good as it gives us +2 might, +2 pen and +1 to power level. Any other food should be fine as well. Note# Captain's Banquet +20% action speed bonus overrides the action speed bonus of our abilities. They don't stack together. Note# Captain's Banquet +20% dmg with spells doesn't work with Avenging Storm for some reason. Note# Crusted Swordfish +2 pen with spells doesn't work with Avenging Storm for some reason. Deadeye is excellent for this build as it gives us accuracy as well as the % interrupt that gets pretty crazy due to multi-shot (Blunderbuss passive). Note# Coral Snuff is not good because its action speed bonus overrides the action speed bonus of our abilities. They don't stack together. Note# For hard encounters, use Deadeye. For general encounters, use any other drugs or even no drugs at all. Scroll of Avenging Storm - Our bread and butter. This is the reason why this build exists. Nuff Said. Scroll of Circle of Protection - Increases our defenses by 15 until combat ends. This is pretty crazy huh? Scroll of Moonwell - Increases our defenses by 10 and gives us a huge amount of constant healing (26.2hp per 3 seconds) for a long duration (40.5s). Scroll of Withdraw - We will only use this as a last resort. It makes us untargetable while healing us but we are stunned for the duration. Note# I only use these set of scrolls for hard encounters. For general encounters, use any other scrolls or even no scrolls at all. Note# No matter how much fun it is to always use Avenging Storm, I only use it when I actually need it. Use it sparingly as it's hard to craft. Note# I'm not using Scroll of Meteor Shower and Scroll of Great Maelstrom because they just one shot everything with maxed out Arcana. Just one question, why no Flagellant's Path on lvl 19? Not sure if this is still viable in 1.1 but you can charge/flagellant with dual blunderbuss and with the extra bounce from kitchen stove it clears horde of enemies... Another secret maybe? I haven't tried yet if it works with ranged. I also need to check if it works with Avenging Storm. If it does, then Flagellant's Path will be amazing on this build! We want to single wield the blunderbuss for the innate +12 accuracy bonus as well as to receive the +20% crit chance perk from 1H Style. Edit: Just tested it. Unfortunately they don't work like that anymore. Looks like Obsidian learnt their mistake with charge so they stopped that from happening with flagellant's path too. By the way, Heaven's Cacophony is a helmet you can buy from Wanika at Queen's Berth, which gives you a 1/rest use of Avenging Storm. Well yes, but you mentioned that Scrolls of Avenging Storm should be used sparingly as they are expensive to craft. I figured that Heaven's Cacophony would really help you cut down on the costs there. I don't see how this build can survive encounters vs multiple ranged rogues. The hard encounters from the first island (gorecci, wyrm,even boars) should be skipped, I suppose. Those uber tanks are too precious to share. Besides, this is the funnest build I have. Did Moonwell stack with Circle of Protection ? How much deflection you have ? Why not hand mortal ? Deflection varies but it's not too high. Reflex is the focus for this build. 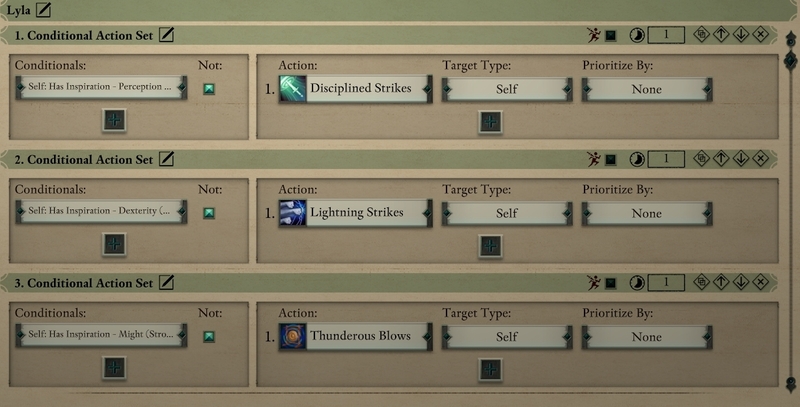 Hand Mortar is fun for AOE but its single target damage is lacking. I mean you can always have it in your 2nd weapon slot. How you survive fights in small/scripted areas with rogues/rangers enemies ? They die quicker faster than they can damage you. :D Also, healing scrolls are really strong with maxed out Arcana. 5 quickslots is enough. Fleshmender is just ok because you lose armor when you get hit. Do you have any tips for earlygame? I guess most of the early fights should be stealth-skipped right? > That's easy. It's a known fact ciphers can solo mobs easy due to their charm spell. And as I see already in your video, your pet is not lasting long + you are quite squishy. You will have troubles with single high hp high damage enemies like Guardian of Ukaizo. > single high hp high damage enemies like Guardian of Ukaizo. Do you see my reflexes ? :D They higher than in your build ? Do you know how much damage can do disintegration ? Do you know something about Pain Link ? Do you know how much penetration I can achieve with Ectopsychic Echo ? Do you know how much accuracy I can stack ? You have base of 147 + 20 (borrowed instinct) for reflex while I have 162 base + 20 (determination) so I have more reflex. I don't even use a shield yet. Disintegration does a lot but Guardian has high fortitude that is why I see a lot of it miss in your video. That is why yours took 14 minutes to kill the boss and mine 8 minutes. Pain Link is just okay but it does add up to your damage so that's good. Penetration is only good if you can double it twice the enemy's armor (to get overpen which gives you +30% damage) otherwise there is no point. My character has 2 less accuracy than yours. Also I am right when I said that your build is very squishy because you drank a lot of potions. Any build can solo the Ukaizo Guardian if they too drink as much potions as you did. > That is why yours took 14 minutes to kill the boss and mine 8 minutes. > My character has 2 less accuracy than yours. My build should be able to do it with just 3 healing potions. 3 moonwell scrolls are actually an overkill because it heals me to full hp and still continuing to do so even If I don't need it anymore. Whereas with potions, I just use it with when I'm low. 2-3 should be more than enough for me. It's good we have this discussion because it helped you optimize your build better. Yeah higher reflex defense is better than having pain link, sacred horrors and mark of the hunt. Nope. Even with mobs, my build will kill faster than yours. Mine hits the boss for 100 per shot, yours at 33 per shot + disintegration damage if it manages to land. With mobs it would be even worse because you will have to rely on charm alot + you will need more focus to do damage on them otherwise your 33 damage per shot + extra 33 dmg to another target (from driving flight) is not enough. Mine deals 100 per shots + extra 100 to another target (from bounce). Just look at my demo video. Yours will be a lot slower because you just do lower damage overall. Yeah that's why I don't take shield because the increased reflex it gives is not enough to offset the penalty I will get. I won't drop drugs because that is part of being a Nalpazca. Does Lesser Wounds passive really work for Nalpazca? If so, how does it work, since you don't get wounds from being hut, but only from being high? Like any other monk you gain wounds when you get hit. The benefit of Nalpazca is you get a steady rate of wound generation if high on top of that. That's why its so good. But then, that would not be your build anymore because you are copying mine. It's good we are having this discussion though because I'm helping you optimize your build to a higher level. Even with nerfed Arcana, I would still do more damage than you but we will see. I will do an updated video once they nerf Arcana. It will not be 14 minutes long and I will also only use 3 health potions rather than 5 health potions + luminous adra potion. My dad is stronger then your dad!